I’m heading back to London tomorrow. 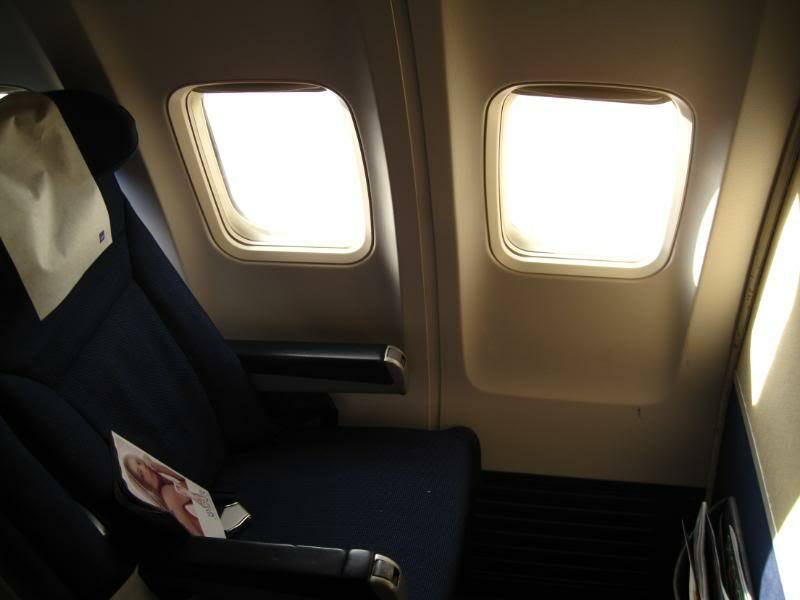 I’ll be sitting in seat 1A on my way to Newark. I don’t think the plane has first class, but if it does, I’m in. This is my first time flying on my own status instead of Stephen’s and I’m a little too excited about it. It’s also my first time flying alone in a long time, hopefully everything will go smoothly. If you’re hanging out in CVG, EWR or LHR tomorrow or Tuesday and get run over by a green suitcase, consider this an advance apology. I never really considered myself a klutz. A klutz is someone like Bella Swan (excuse the Twilight reference) who can’t seem to put one foot in front of the other and has trouble dancing. I don’t want to brag, but I recently scored an “A” on difficult mode of Dance Dance Revolution on my Wii. I like to think I’m quick on my feet, but lately I’ve been having a problem — I run into furniture and other stationary objects and have the bruises to prove it. It wasn’t a one time thing — “I was in a hurry and bumped my hip on the bedpost as I ran to get the phone.” No, I seem to run into my bedpost with my hip several times a month. Once one unsightly bruise heals, I manage to get another one. Sometimes I immediately notice after I do it and will add a “Seriously? Again? !” as I cry out in pain. But other times the random hip and leg bruises appear and I have no recollection of what furniture item caused them. Once I had a wicked bruise on my forehead because I hit my head on a doorway. I’m still not sure how I pulled that one off. In fact, I can’t figure out how any of these incidents happen. Am I losing my spatial/depth perception ability? I obviously know the bed is there and it’s sharp, yet my body insists on cutting it too close. Since I’m not in London at the moment where my bed with the ridiculously pointy corners is, I thought I might be bruise-free for a little bit. Wrong. Yesterday I went to hang out with a friend. She dropped me off at my car after dinner and when getting out I hit my collar bone on her car door — that extraordinary sharp and pointy part where the side of the door meets the top. I was wearing a sweater, scarf and giant puffy coat and it still hurt like nobody’s business. The bruise hasn’t formed yet, but I can feel it growing. If you see me wearing a lot of turtlenecks this week, you’ll know why. They want me to fill out a survey or apply for a credit card or something, I stopped reading halfway through, it was that long. You want me to bring my own bags to save on paper bags, but I can think of other ways you can save paper, Kroger! “Emergency Calls Only,” or Why Doesn’t Anyone in the US Use a Sim Card? Since I’m going to be in the US until the end of the month, I figured I should probably get a phone. It has been nice flying under the radar, but there are times, especially when driving, when a AAA or 911 call might be necessary. So I went to Best Buy last week and asked the guy in the mobile phone department which would be cheaper — buying a pay-as-you-go phone or a sim. For a second I thought the guy was going to ask “What’s a sim?” He had absolutely no idea how to help me. The rest of the world, or London and China, at least, seems to be big on the pay-as-you-go sim. Since I don’t use my mobile very much in London, that’s what I have, and it’s been great. I foolishly thought I could get the same thing in the states. He bumbled over and tried to help, but it was obviously he had never sold anything pay-as-you-go. Buying a phone would cost $20 for the phone, plus $25 for a month of minutes. I was not willing to shell out $45 for something I’d rarely use. 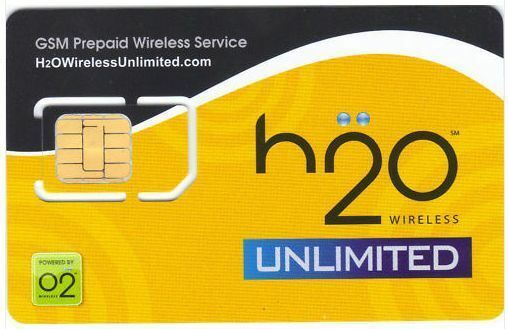 So I asked him about the H20 Wireless sim. He pretty much read me the package, as it was clear they had never sold one before. It sounded like the best deal for me — $10 for the sim, then 14 cents a minute, or $1 a day for unlimited nights. He warmed me that the coverage might not be very good, but I should be OK if I stayed in the metropolitan area. So I bought it. I took it home, activated it, loaded $10 on it, and put it in my phone. “Emergency calls only,” it displayed. I waited a couple hours, then tried again. No luck. The next day I chatted with a customer service representative online. His name was Edgarp. He pretty much told me my account was active and I should check my coverage. I’m not sure how you do that, but I guess “Emergency calls only” is a sign that you are not in the coverage area. He told me to go outside and try. I held my phone out the front door like some guy in a crappy phone commercial. It didn’t work. I figured maybe it was just my neighborhood. So I took the phone with me to visit my friend who lives north of downtown Cincinnati. Periodically through my drive I would check the phone. Emergency calls only. I finally realized Best Buy sold me a sim that offers no coverage in the entire greater Cincinnati area. So I called H20 Wireless to at least try to get the $10 I added to my account back, since there was no way I’d be making $10 worth of emergency calls. I waited on hold for 10 minutes, then spoke to someone who put me on hold and transferred me to the finance department. “May I ask where you are calling from?” The representative asked in a heavy Indian accent. After a discuss about fried chicken, the guy reluctantly refunded me my money. Thanks, Colonel. And it’s nice to know that people in India know about Kentucky, even if it is only because of the chicken. I’m debating whether I should try returning the sim at Best Buy and letting them know that they’re selling something that doesn’t work, or if I should just count the $10 as a loss. Going to Best Buy would involve digging my car out of the snow. Continually borrowing my parent’s phones is suddenly not so bad. 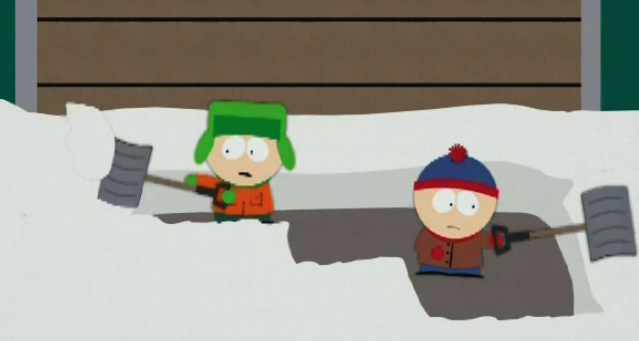 Today northern Kentucky received its version of White Death (3 inches of snow). All the schools were off and people freaked out in their usual manner. Last month I wrote about cities that receive a lot of snow and know how to deal with it vs. cities that rarely receive snow and don’t know how to handle it. I left out Cincinnati — a city that receives a lot of snow yet still hasn’t learned how to handle it. Snow is not rare here, but the way they cancel school at the first flake and put off plowing, it’s as if it’s snowing in Arizona. I’ll admit I don’t quite have the “Six inches? That’s nothing! Let’s drive!” mentality that my parents have from living in Cleveland and Pittsburgh, but even I would have driven today, had I someplace to go. Instead I went out and shoveled the driveway before my dad got home from work. It’s been over five years since I’ve shoveled a driveway. I think I blocked out how miserable it is. By the time we finished my back and arms were aching and I had snow in my socks. I remember writing a vignette about snow shoveling in high school. I believe I called it, “When the Weather Outside is Frightful, Shoveling is Not Delightful.” Oh, I was so clever back in the day. The worst part is that it is still coming down, so we’ll probably have to go back out tomorrow and do it again. Suddenly London rain doesn’t seem so bad. Since I’m in the states until the end of the month, I’m stocking up on things I either can’t get in the UK or don’t want to overpay for there. Avon Glimmersticks eyeliner is my favorite eyeliner and I use it everyday. I have almost all the colors, but seem to be favoring black lately, so I thought I should stock up. One costs $6 on Avon.com, but a lot of Avon reps sell it for cheaper on eBay. Some will sell them for $2.79 and then charge 99 cents shipping no matter how many you buy. That’s a good deal, but I was on the hunt for an even better bargain. I saw a seller had several lots of four up for auction. If I bought four from the $2.79 lady, my order would cost $12.16. Keeping that in mind, I bid a maximum of $8 on the lot of four, knowing that shipping would be $2. The lot had previously gone for over $8, so I imagined I would be outbid. Here is where the eBay Foul comes in — I bid $5 on a second lot. Looking back, I have no idea what I was thinking. I guess I figured there was no way it would sell for $5 and I would likely lose both auctions and have to try again the next day. Of course, that didn’t happen. I won both auctions. The first one went for $5.52, the second $4.25. I have no idea who bid $5.51 to make my bid $5.52. I emailed the seller and asked if she would combine shipping. I never heard from her. I had already paid for the first lot and she shipped it out today. I can understand her not wanting to combine shipping, she just let $24 worth of product go for $4.25. So now I have eight black eyeliners coming to me, for the price of two. 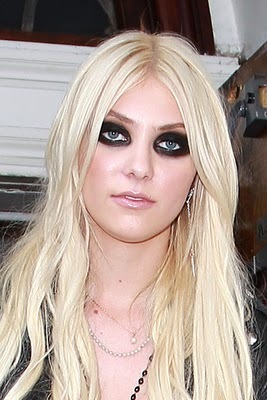 Maybe I should start rocking the Taylor Momsen look to burn through them faster. For those of you following my Chase Free Checking Crisis of 2011, I’m happy to report that I visited a branch today and was informed that Paypal does count as direct deposit, so my checking account will remain free if I transfer at least $500 a month. My personal banker was very friendly and accommodating, but of course wouldn’t let me leave after only answering my simple question. She wanted my life story and to send me away with as many credit cards and accounts as possible. I cut her off when she started going into retirement plans, but I did leave with a new savings account, something I probably should have opened years ago anyway. 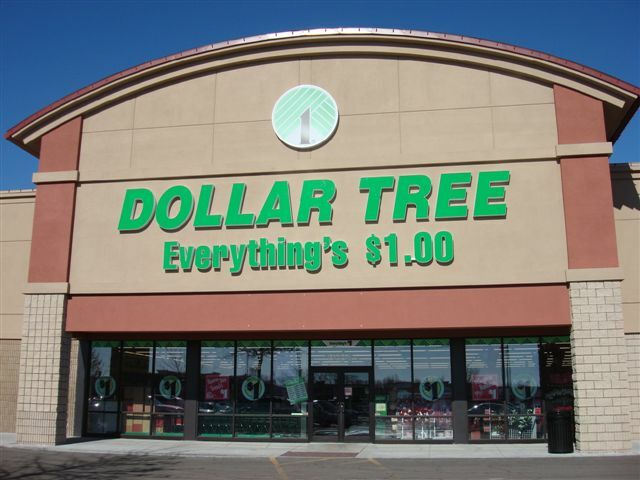 Before the bank I hit up the dollar store. I always want to buy everything in that store, even though I don’t need most (OK, any) of it and the rest I can get for less than a dollar somewhere else. Jay Leno does a feature about the random weird crap you can find at the dollar store. I would like to do a feature on Stuff You Shouldn’t Trust Because It’s $1. I saw a lot of examples today — diet pills, hair coloring and pregnancy tests. Those all seem like things that are worth paying a little extra for quality. I restrained myself and left with a nail file/buffer kit and caramel cream candies, two things I don’t mind spending $2 on.